The values of Bitcoin, Ripple, and other cryptocurrencies have been crashing lately, but one analyst is predicting a huge rise ahead for Bitcoin—with a forecast for it to reach as high as $100,000 in 2018. 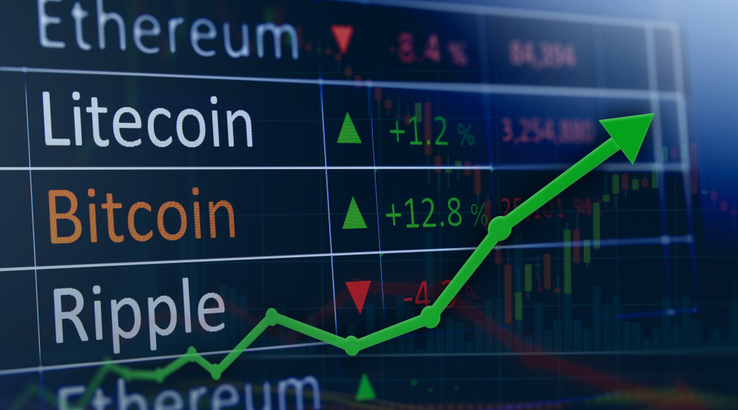 “Investors appear to be taking a breather from bitcoin for now and looking at alternative cryptocurrencies,” technology correspondent Arjun Kharpal said in a CNBC story. Bitcoin headed to $100,000 in 2018, says analyst who predicted last year’s price rise. Bitcoin could hit $100,000 in 2018, an analyst who correctly predicted the cryptocurrency’s rally at the start of last year told CNBC. Kay Van-Petersen, an analyst at Saxo Bank, said in December 2016 that bitcoin would reach $2,000 in 2017, a feat achieved in May. Van-Petersen now says bitcoin will be driven by a larger uptake of institutional investors and futures contracts. There are individuals within the financial world who believe bitcoin will breach the $100,000 mark this year.Kerim Derhalli, CEO of investment app Invstr, said: “Bitcoin is the next logical stage of the information revolution. This time a year ago it was worth under a $1,000. I predict next year  it could hit the $50,000 to $100,000 mark. Nick Spanos, founder of Zap.org and the Bitcoin Centre NYC, said: “Bitcoin has a stellar year ahead . No matter how low bitcoin went in the past, it always climbed back at least a few times stronger. Not everyone is so concerned about Bitcoin’s movement. John McAfee, famed for his role in creating the world’s first commercial antivirus software and a noted cryptocurrency follower, has doubled down on his prediction that Bitcoin could reach unparalleled heights in 2018: Jon MacAfee: “For you who are long term investors like myself: (those who allways make the most returns), BITCOIN is still the crypto giant. It is at a low price, and will never be cheaper. It will be ten times this price in 2018. Remember – it has the lowest circulating supply of any coin. McAfee isn’t alone in his thoughts that Bitcoin’s price could go further, but some believe it’s because the bubble could go higher before catastrophically popping. However, pointing to evidence that more people want to buy in, Bitcoin expert Spencer Bogart said that he could see the cryptocurrency hitting $50,000 over the coming year. An October poll by Harris showed two percent of Americans own Bitcoin but 19 percent said they are likely to buy over the next five years, representing a tenfold increase in market size. Tom Lee Says BTC Will Hit $25,000 in 2018, Advises ‘Aggressive’ Buying At Market Low. Co-founder and Fundstat strategist Tom Lee predicted that Bitcoin (BTC) will hit $25,000 by the end of this year in an interview with CNBC today, Jan. 18. Lee had previously forecasted that BTC would only reach this mark by 2022. The Wall Street strategist told CNBC today that now by 2022 he sees BTC hitting the $125,000 mark. Bitcoin will not survive but that does not mean the entire cryptocurrency craze is dead with useful cryptos like Ripple and Ethereum surpassing bitcoin, Benjamin Quinlan, chief executive officer and managing partner at Quinlan and Associates revealed. Speaking to Bloomberg, he said: “We think that various forms of cryptocurrencies will survive and will do very well. “We think that cryptocurrencies with potential applications and utilities such as ethereum or ether, smart contracts can be built on top of it, decentralised applications. “Bitcoin in its current form can’t do that.” “Other cryptocurrecnies have anonymity functions and privacy that far surpasses the level of bitcoin and some have transaction processing times that also surpass bitcoin.” Quinlan compared bitcoin to early social media platforms which were overtaken but newer, more functional sites. He said: “If we look at, and we drew an analogy and I’ve spoken about this before to our clients, it really is if you equate the blockchain technology to something like the internet. “You look at the underlying applications of it, social media is just one application of the internet whereas cryptocurrencies is just one application of the blockchain. Keep in mind that attempting to offer a short term prediction for the price of Ether is a difficult endeavor. For starters, the price of a single Ether is so volatile that it can lose 25% of its value in one day, only to regain it in the next. The most recent example is, 50 days ago was a bit under $300 and now is $1,200. But there was a lot of volatility in the last few weeks with Ethereum going to as low as $550 and back to $770, and now at $1,200 after it was for short time at $1,300. This volatility, as well as the novelty of this currency – Ethereum was started 2014 – drain technical analysis from any potency it might have in making Ethereum price predictions for 2018. Rendering any forecast suspicious at best. Therefore, all the following predictions take a long-term look at things. BITCOIN may soon have to take a backseat to its offspring bitcoin cash, the ‘bitcoin oracle’ Vinny Lingham has said. Bitcoin Cash Price Prediction 2018: Is it too late to buy Bitcoin Cash? 2017 was a big year for Bitcoin Cash. What will 2018 hold? Bitcoin Cash (BCH) had an eventful year in 2017. It was created in August as fork of bitcoin, amidst a storm of controversy. It quickly beat back the doubters with strong growth and reached a high of over US$900 by the end of the month. Then it slumped back down. But in November it quickly surged to around $2,000 as people jumped aboard following bitcoin’s Segwit2x controversy. Then the market readjusted and it slumped again. It leapt again just before Christmas though. When CoinBase announced that it would be accepting Bitcoin Cash, prices jumped to a new all time high of over $4,000. As it entered the new year, BCH prices were riding at a relatively consistent $2,500. Since its creation Bitcoin Cash has ballooned with little encouragement. Wider available has always seen plenty of new users jump on board, with corresponding price rises. A quick look at its brief price history makes it easy to conclude that it still has room to grow. It’s still nowhere near as widely available as bitcoin or Ethereum, so there’s the potential for more spikes as it’s picked up by additional exchanges and further opened to the market. Traditionally it’s also tended to draw most of its new users from dissatisfied bitcoin buyers. This might continue until BTC resolves its problems with transaction times, and transaction fees. Each spike has added tens of millions to the Bitcoin Cash market cap. Despite the inevitable readjustments, it’s always stayed higher than it started. If you feel like Bitcoin Cash has more spikes in its future, it might be worth putting some money behind it. It’s also very technologically familiar, functioning a lot like bitcoin other than a larger block size. This means some of the new bitcoin infrastructure, such as bitcoin ATMs, bitcoin EFTPOS cards and more, could make the switch to Bitcoin Cash relatively easily. Bitcoin Cash has attracted some major supporters, especially in the form of dissatisfied bitcoin converts. For example, the founder and CEO of Bitcoin.com publicly announced that he was done with bitcoin and turning everything to Bitcoin Cash. This growing support is likely to drive further growth of Bitcoin Cash as a valid payment method, and draw over more of the infrastructure that’s been getting behind bitcoin core. Ripple XRP/USD: Ripple price: Is XRP the next bitcoin? How high could the price go? RIPPLE’S price has skyrocketed over the past year, with some experts tipping XRP to catch up to bitcoin. But is Ripple the next bitcoin and how high could the price go? Ripple’s XRP currency was trading at about $0.006 per token at the start of 2017, before a remarkable 12 months saw the cryptocurrency surge to an all time high of $3.84 on January 4 – an increase of nearly 64,000 percent.Ripple has since slipped back down to below $2, but its strong overall performance has fuelled speculation that it could soon compete with bitcoin (BTC) at the top of the crypto markets.A panel of cryptocurrency experts, brought together by Finder.com, predicted that Ripple will overtake Ethereum (ETH) to become the second biggest cryptocurrency by the end of the year.According to the panel’s forecasts, bitcoin will remain top dog, with a market cap of $597.95 billion, followed by Ripple at $460.00 billion. IOTA is an open-source distributed ledger protocol that goes ‘beyond blockchain’ through its core invention of the blockless ‘Tangle’. The IOTA Tangle is a quantum-proof Directed Acyclic Graph, with no fees on transactions & no fixed limit on how many transactions can be confirmed per second in the network. Instead, throughput grows in conjunction with activity in the network; the more activity, the faster the network. Unlike blockchain architecture, IOTA has no separation between users and validators; rather, validation is an intrinsic property of using the ledger, thus avoiding centralization. IOTA is initially focused on serving as the backbone of the emerging Internet-of-Things (IoT). For a more in depth look at the technical design of IOTA read their https://iota.org/IOTA_Whitepaper.pdf. Over the past two months IOTA tokens suddenly became one of the most-talked about cryptocurrencies of 2017. CoinMarketCap estimates IOTA now has a market cap of more than $10 billion, which outranks more popular tokens such as monero, zcash and Neo in terms of global transactions and speculative value. Robert Bosch Venture Capital recently became the first VC firm to invest in IOTA. IOTA is still considered an extremely young cryptocurrency in terms of technical development and adoption. Its white paper was first published in 2015. Then a group of volunteer developers ran a token generation event (before initial coin offerings became a hip trend) to raise around $500,000 and establish the nonprofit IOTA foundation in Germany. IOTA offers a radically different approach to cryptocurrency, one without miners or a traditional blockchain network. This solves two of bitcoin’s biggest pain points: Slow processing and high transaction fees. Even beyond powering blockchain systems, miners have a very important role in a currency’s lifecycle: Miners create new tokens. Dollars are printed and tokens are usually mined with fancy software. New tokens compensate miners for lending their computing power to verify data. It’s like a food chain. How could a cryptocurrency work without this foundation? IOTA’s creators already made lots of tokens, 2,779,530,283,277,761 tokens to be precise. So there’s no need for miners to make more of them. Every user pitches in a little bit of computing power to making sure data is correct and complete. Theoretically, there’s no need to line up and wait for a miner, who then deserves compensation for such heavy-lifting. However, fast and free micropayments required a trade-off when it came to decentralization and security features. The Massachusetts Institute of Technology Media Lab pointed out several serious flaws in this new cryptocurrency network. They took issue with the claim that IOTA doesn’t have any fees. “Most people wouldn’t be interested in buying a refrigerator operated by a hand crank, even if the advertisement said ‘No electricity required!’” the MIT report said. Secondly, there are technical questions about the security of IOTA’s underlying algorithms and infrastructure. Right now the nonprofit’s central “coordinator” software facilitates most IOTA transactions, filling in the role miners play in the bitcoin or Ethereum network. The IOTA team plans to deactivate the central coordinator when more users organically take up the workload. But it is impossible to say if or how that would actually work when high transaction volumes flood the network. The IOTA foundation is developing a global marketplace to tokenize the vast amounts of data collected by IoT devices. In the future, when high-tech products automate buying more eggs for your smart fridge when you run out, IOTA might be an ideal currency for those tiny payments. Companies like Microsoft and Deutsche Telekom are already experimenting with the bare bones of this system. Whenever a new participant publicly declares interest in IOTA’s marketplace or network, token prices surge. IOTA tokens cost less than $0.50 in November, according to CoinMarketCap, then peaked at $5 a piece on December 20. It stands to reason that IOTA prices could continue to rise if the marketplace attracts more enterprise users. Cryptocurrency veterans often criticize IOTA by raising qualms about the network’s tokens. For example, crypto hedge fund manager and Coinbase alumni Lindia Xie wrote a blog post saying the IOTA team’s take on cryptographic hash functions raised several red flags. Supporters hear that criticism and agree the token’s system still has many kinks to work out. Most IOTA supporters believe it will take a long time to perfect the token. In the meantime, volunteers are developing the network’s IoT backbone, including a global data marketplace and unique features for a variety of high-tech devices.